Villagers at Pak Poun villages group traditionally cut down the Talipot to obtain the top for food but they now preserve Talipot forests for producing handicraft. 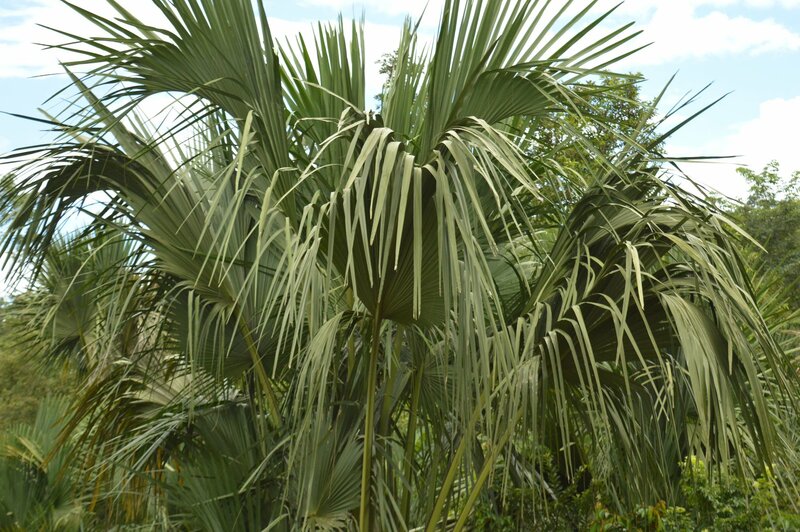 This change is contributing to towards a sustainable livelihood for those involved. 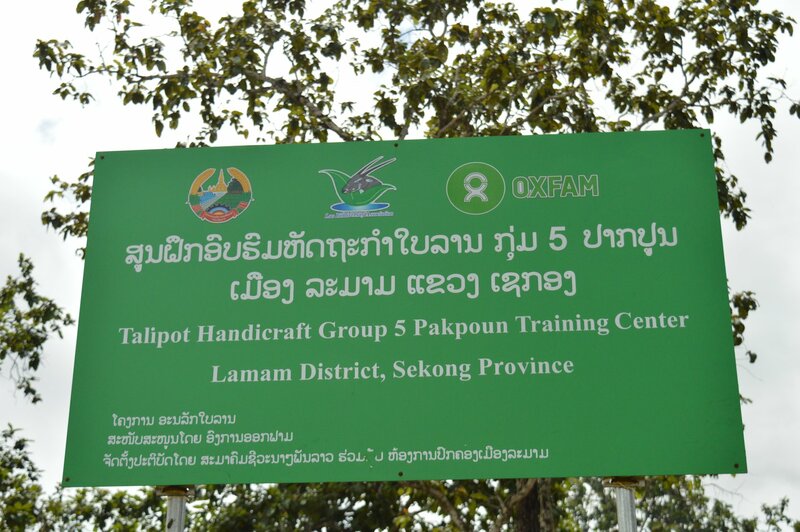 This change was captured during the monitoring trip, which was conducted during 3-5 September 2018 in Lamam district, Sekong province, where Oxfam supports Lao Biodiversity Association on a project entitled "Promotion of integrated conservation and livelihoods development in Phou Chrouad (Talipot) Forest Conservation Area in Sekong Province". Villagers, especially the women, are excited to be able to sell their products and have added income. They hope they can make the dream of One District One Product come true - a goal for the district and Sekong provincial authorities. Talipot (ຕົ້ນລານ): ຈາກ ອາຫານ ສູ່ ງານຫັດຖະກໍາ! ໃນອະດີດ ປະຊາຊົນຢູ່ກຸ່ມບ້ານປາກປຸ້ນ ຈະຕັດຕົ້ນລານເພື່ອເອົາຍອດມາປຸງແຕ່ງອາຫານ, ແຕ່ໃນປະຈຸບັນ ເຂົາເຈົ້າໄດ້ຮັກສາປ່າຕົ້ນລານໄວ້ ເພື່ອນໍາໃຊ້ເຂົ້າໃນການຜະລິດເຄື່ອງຫັດຖະກໍາ. ການປ່ຽນແປງນີ້ ສົ່ງເສິມວິຖີຊີວິດແບບຍືນຍົງສໍາລັບທຸກຄົນໆທີ່ມີສ່ວນຮ່ວມ. ປະຊາຊົນ ໂດຍສະເພາະແມ່ນເພດຍິງ ແມ່ນມີຄວາມຕື່ນເຕັ້ນດີໃຈ ທີ່ສາມາດຂາຍຜະລິດຕະພັນຂອງຕົນເອງ ແລະ ຍັງມີລາຍຮັບເພີ່ມເຂົ້າມາໃຫ້ຄອບຄົວ. ພ້ອມກັນນັ້ນ ເຂົາເຈົ້າກໍ່ຍັງຫວັງທີ່ຈະສ້າງຝັນ ໃນການສ້າງຜະລິດຕະພັນຂອງເຂົາເຈົ້າໃຫ້ກາຍເປັນ ໜຶ່ງຜະລິດຕະພັນໜຶ່ງເມືອງ ໃຫ້ເປັນຈິງ ຊຶ່ງນີ້ກໍ່ເປັນອີກໜຶ່ງເປົ້າໝາຍຂອງອໍານາດການປົກຄອງເມືອງ ແລະ ແຂວງເຊກອງ ອີກດ້ວຍ.